This Northern city became world-famous thanks to its major part in the Industrial Revolution. The 18th century saw Liverpool’s population explode as people flocked to the city to work, and the 19th century cemented its place as one of the world’s most important ports. In the 20th century Liverpool set the scene to become the capital of pop, while the 21st century saw it finally honoured as a European Capital of Culture. If you come to Liverpool to learn English, chances are that you will meet a Scouser or two. Scousers (aka Liverpudlians) are known for their friendliness, their distinctive accent, and their passion for life, music, and football. They take their name from a kind of stew eaten in the city. It has its origins in a sailors’ dish (lapskaus or lobscouse) made of dried meat and biscuits with added hot water. Originally a food for the poor, Scouse evolved into a much more appetising meal with the addition of potatoes, onions, carrots, and cheap cuts of meat such as mutton neck or beef. Our English-language school is close to some of the city’s best-known sites and attractions, giving you the perfect opportunity to experience The Pool for yourself! Read about some of the main points of interest and then see them on the map below! With two big football clubs less than 10 minutes away from each other, the sporting atmosphere in this city is unique. Anfield Road and Goodison Park are both beautiful stadiums, each with their own culture. Both of the city’s teams play in the highest football division in England: The Premier League. Anfield Road (Liverpool FC) accommodates 55,000 people and offers hourly tours, including a visit to the dressing room, the pitch, and the press room. 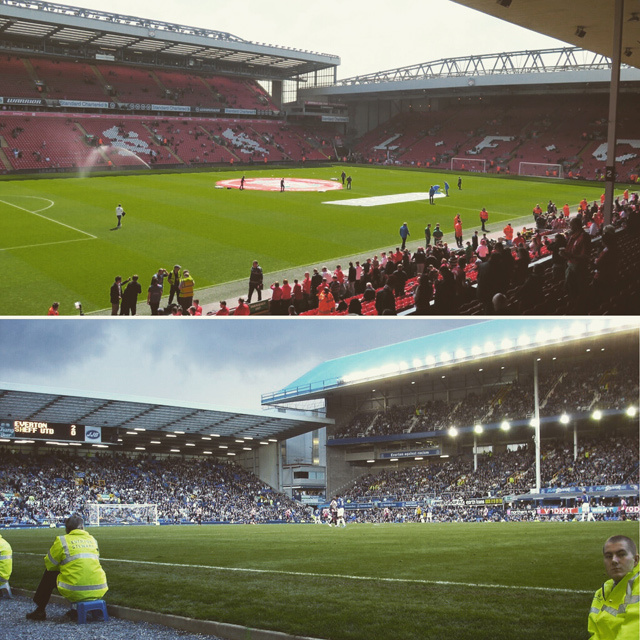 Top: Anfield – Bottom: Goodison Park on match day. It goes without saying that Liverpool’s motto is not ‘You’ll Never Walk Alone’ for nothing – if there is one football audience that is loyal to its club, it’s the Kopites of Liverpool. One of the best-supported clubs in the world, there are over 200 officially-recognised Supporters’ Clubs across 50 countries; at home, around 25,000 people purchase season tickets at Anfield each year. After (or before) visiting Anfield you should also take a look at Goodison Park, home to Everton FC and just a short walk away from the Reds’ ground. During the tour of this stadium you immediately notice the difference between the city’s two clubs. Goodison Park is noticeably less commercial than Anfield, which gave the visit – at least in our eyes – a much more personal feel. There are also fewer tours available (so it’s advisable to book in advance) and they are less crowded than those at Anfield. We were fortunate enough to meet an ex-Everton captain who, afterwards, accompanied us and told us some beautiful anecdotes about his time with the club. Since Everton FC is a smaller club, you may meet an old player on your tour, too! 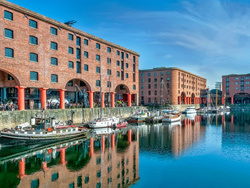 When visiting to Liverpool, you are obliged to pay a visit to the Albert Dock. Covering 5 fully-renovated warehouses dating from 1846, the Dock once served as ship-loading platforms. Made entirely out of cast-iron, brick, and stone (but not wood), it was the first non-combustible warehouse structure of its kind and has therefore influenced industrial building methods across the world. Today you will find trendy restaurants and shops here, as well as museums such as the Tate Liverpool (where you can take a picture with Salvador Dali’s Aphrodisiac Telephone). It can get quite busy, especially at weekends, but as one of Liverpool’s top tourist destinations it’s well worth a visit! Because of its historical value, this area belongs on the UNESCO World Heritage List. If you can, take the time to go to Crosby Beach, which is north of the city and extends about 4 km along the Merseyside coast, starting north-west of the Seaforth Dock to end in Waterloo. The beach is particularly known for its sculptures of Another Place, designed by Antony Gormley. 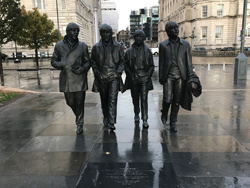 Also at the Albert Dock is The Beatles Story museum, offering a detailed history of the Fab Four‘s life and careers, including their solo works. With recreations of The Casbah Coffee Club and Abbey Road Studios, the museum depicts the band’s meteoric rise and includes exhibits such as John Lennon’s last piano and costumes worn by the members. To gain a unique insight into the lives of McCartney, Lennon, Harrison, and Starr you should also attend the Mendips & Forthlin Road Tour, which not only takes you past the band members’ old houses but also to the studios where many of their first songs were composed and recorded. 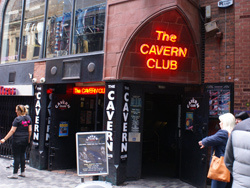 On your travels, drop by the legendary Cavern Club, where you can enjoy a tasty pint and some great live music, including Beatles covers by local bands (how could it be otherwise?!). But, whatever you do, don’t make the mistake of thinking that The Beatles is all the city can offer! Liverpudlians can be sensitive about this, and rightly so – more number-one musicians hail from The Pool than from any other UK location, including the likes of Frankie Goes to Hollywood, Elvis Costello, The Lightning Seeds, The Wombats, and Cilla Black. With the largest collection of grade-II listed buildings outside of London, Liverpool is a Mecca for architecture-lovers. Swing by the iconic Royal Liver Building, topped with twin liver birds – as the story goes, the female looks out to sea to watch over sailors far from home, and the male faces the city, watching over the sailors’ families. It’s one of the Three Graces at Pier Head, along with the Cunard Building and the Port of Liverpool Building. Then of course there’s the cathedral, which holds the title of Britain’s largest and the world’s longest. It towers above the city on St James’ Mount and contains sculptures and artworks from noted Liverpudlian artists including Edward Carter Preston and Don McKinlay. Also worth a walk past are the Bluecoat Chambers on College Lane, the oldest surviving building in central Liverpool, or the Town Hall, built in 1754 and now the residence of the Lord Mayor. For more modern styles, head to William Brown Street to see the Neoclassical Picton Reading Room, Britain’s first electrically-lit building, or to Lime Street for the impressive North Western Hotel. What’s more, the city was the site of many national and international firsts, such as the world’s first overhead railway (1893), England’s first girls’ grammar school (1844), the world’s first public washrooms (1841), the world’s first train shed (1830), England’s first lending library (1758), the world’s first public art gallery (1877), the first Woolworth store (1909), and the first specialist school for blind students (1791). If you like shopping, you are in luck – Liverpudlians love to look good, and pride themselves on setting trends. There are plenty of shopping centres, galleries, and markets in the centre, all within easy reach of our English school. Arguably the best place for shopping is Liverpool ONE, the open-air complex close to the waterfront with more than 170 shops, bars, restaurants, and well-known designer outlets, including the only Harvey Nichols Beauty Bazaar in England. Fashionistas should head to the Cavern Quarter, home of designer boutiques and haute couture brands. For more quirky finds, try Bold Street, with its independent shops, vintage stores, and great street food vendors. If you’re venturing outside the city, Cheshire Oaks Designer Outlet offers a variety of brands including Warehouse, Calvin Klein, North Face, and Burberry. There’s also a selection of food chains to keep you going during your day’s retail therapy! We promised we would follow up our Manchester post with another account of an incredible English city. If you are staying for a long-term language course in either Liverpool or Manchester, it’s great to know that you can visit either city in one fun-packed day. On an average weekday there are over 50 trains travelling from Liverpool Lime Street to Manchester Piccadilly. The journey time is between 50 and 80 minutes. It’s also possible to travel by coach, which takes a little longer but is usually cheaper. Our schools would love to welcome you and help you hone your language skills. As part of the cultural activity programme organised in each location, you’ll visit some of the best sites of each city, learn about its history and culture, and meets some of its locals. After class you can explore to your heart’s desire and immerse yourself in these iconic northern cities. So what are you waiting for? !